Siesta Key is famous for its white silky smooth sand, quiet beaches, and rich wildlife. All of these iconic components of Siesta Key are part of what attracts visitors of all ages here every year. The promise of seeing dolphins is another one of the top things to do that interest visitors, as they can be viewed up close during dolphin tours throughout the year. Dolphins dip and dive along the coast of Siesta Key, and you can join them with the right tour provider. 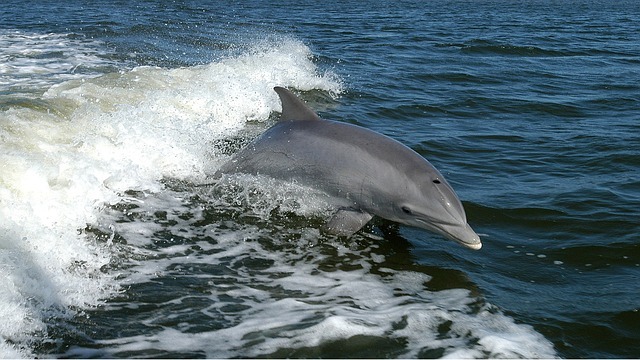 The following three Siesta Key dolphin tours are all about the thrill of seeing local wildlife in person. Take a private boat off into the water and spot dolphins as they leap across the surface, follow your boat, and showcase their playful personalities. Afterward, have a relaxing dinner on the boat or a nearby restaurant and watch the sunset, completing your journey into the pristine waters around Siesta Key. Kokomo Charters is a leading dolphin tour provider on Siesta Key with dozens of glowing reviews for a reason. This three-hour journey on a captained Sea Ray boat will take you along the coast of Siesta Key and out into the Gulf of Mexico on a fascinating journey where you’re virtually guaranteed to spot dolphins. No single trip is exactly like another. Some trips may have you visiting a local sandbar, where guests are allowed to leave the boat and step into the transparent blue-hued waters on the hunt for shells. The captain may take guests to see manatees in their favorite areas or places where dolphins play and feed. Couples along for tours can also get the “romantic” package. It’s a sunset tour over the gulf, with appetizers, dinner, and drinks to soak in the setting. If all goes well, dolphins will splash in the waters and make your trip even more magical. For strict relaxation and cruising, each of the two boats features a lounge area with a windshield to protect from excessive wind. Music from the sound system adds any kind of musical ambiance you want. The captain will cruise upwards of an hour and a half out into the water or down the coastline. It is even possible for Kokomo Charters to fit a group on the same day. Don’t hesitate to give them a call at 941-266-3776 to see if you can get on the water sooner than later. They cover every ocean experience you could want, and their captains have created many eternal memories of Siesta Key. Key Life Charters, outside Turtle Beach, delivers an experience on par with the top outdoor activities on Siesta Key. The captain takes you on a journey to view frolicking dolphins during the mornings off Siesta Key. Though dolphins create the one unifying element with all tours, guests can book an evening boat trip to see the sunset or go tubing as the captain weaves through the waters. 4240 for information about booking a dolphin charter. Siesta Key Fishing Charters delivers a wonderful water experience. The team places an added emphasis on fishing, but the captain has no issue with taking a relaxed sunset cruise towards some of the major dolphin hangout areas if you wish. Contact them at 727-641-2665 for details on the fishing attractions, excursions, and available trip times. The beautiful calm waters around Siesta Key are home to dolphins in every season, making it one of the absolute best places to see them on a beach vacation. Dolphins are highly intelligent and know the boats are out there and the people want to see them. If you catch them at the right time with the help of an experienced boat captain, they’ll perform just for you!